It is known that workers in the Information Technology (IT) and Information Technology Enabled Services (ITES)  sectors are predisposed to several cardiovascular risk factors. , However, there are no studies done in India that document job stress and its association to hypertension among the IT/ITES professionals. We conducted a cross-sectional study among professionals working in IT and ITES sectors. In this study, we estimated prevalence of job stress and its association with hypertension. Understanding the prevalence's of job stress and other risk factors within this specialized workforce can help to prevent morbidity related complications. Identification of risk profiles in this workforce can guide worksite interventions to prevent debilitating conditions thereby improving the productivity of the workforce. A detailed description of methods in the study is provided in our earlier paper on methods. Pertinent important portions of methods are presented in this paper. The source population comprised all IT/ITES professionals aged 20-59 years working in "technical functions" in 21 selected worksites (units) of the IT/ITES sector willing to join the study. We conducted a cross-sectional study of IT/ITES professionals in Bangalore, third largest in India by population and the IT capital of India. , In 2011, Bangalore had more than 1000 IT/ITES companies in which greater than 150,000 IT/ITES professionals worked. , We followed mixed methods sampling strategy having an initial stage of probability sampling followed by the final stage of purposive sampling was used to select the IT/ITES professionals for this study. Detailed methods paper is published earlier. The first stage involved a stratified sampling (quota sampling) to select the geographic clusters of IT/ITES companies scattered in Bangalore and in the second stage, individual IT/ITES unit within each selected clusters based on purposive sampling techniques. ,, The sampling was done such that there was at least one unit representing every geographical area having IT/ITES companies in Bangalore. Thus from 17 selected geographic clusters 21 worksites (units) were selected. In each unit, after obtaining necessary administrative permissions, eligible employees were recruited after providing informed consent. The study was anonymous, and no names or other personal identifying information were collected from the participants. Each participant was assigned a unique number that linked individual information of the participants for the purpose of the analyses. Quiet private rooms provided by IT/ITES companies were used for collection of information for both qualitative and quantitative phases. The study was reviewed and approved by the UCLA Institutional Review Board (IRB, #G09-12-002-01, IRB#10-001348) and the ethics committee of the Public Health Foundation of India (TRC-IEC 40/10). A job stress questionnaire was self-administered to collect information on job stress and other risk factors. Specifically, we used two different types of exposure assessments. The first measure was the occupational stress index,  a validated, reliable and tested measure that has pre-defined specific domains of job stress. Secondly, we identified contextual stress domains based on our qualitative study. These contextual domains would better describe the stressful conditions of the IT/ITES industry as information regarding these domains was directly collected from the professionals. These are time pressure, length of experience, shift work, job control, income, autonomy, appreciation of work, physical environment, work-environment and affect. The details regarding estimation of each domain is provided in our earlier publication. The estimation of two domains is provided here are of focus in this paper. The autonomy domain of stress was estimated by calculating the weighted average of responses to questions on "who is in charge of deciding your work schedule?" "Who evaluates your work?" and "Is your work constantly monitored?" Here, each question had three responses. We calculated the sum of all three questions on a total of nine and multiplied by 100. Appreciation of work was estimated by estimating the weighted average of responses to questions "Is your good work appreciated or recognized at your workplace?" and "has the credit for your work is taken by your supervisor?" All the stress domains were coded such that for increasing order of contextual stress. The data from the cross-sectional survey was analyzed using SAS 9.1.3104 (Business Analytics and Business Intelligence Software. 100 SAS Campus Dr, Cary, NC 27513, United States). We used ordinal logistic regression for all our estimates. The sample comprised of a total of 1071 subjects that included 599 IT professionals and 472 ITES professionals. 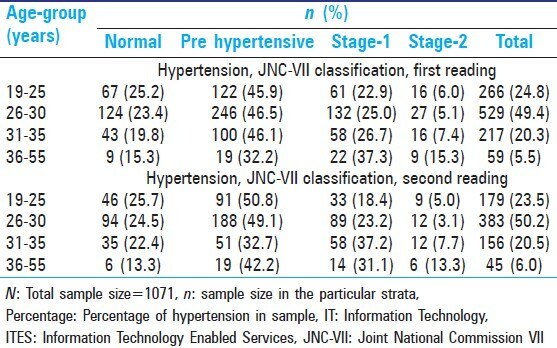 After two readings and according to the JNC-VII classification,  the prevalence of pre-hypertension was 45.7%, of stage-1 was 25.43% and stage-2 was 5% [Table 1]. 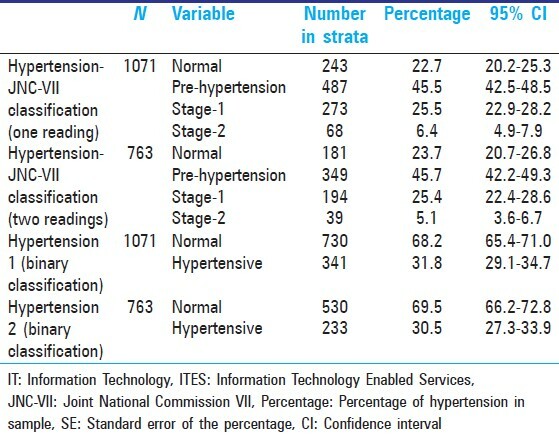 By considering binary classification, the prevalence of hypertension was 31% [Table 1]. The prevalence of stage-1 hypertension in the age group of 19-25 years was 18% and 23% in 26-30 years group while the prevalence of stage-2 hypertension in the age group of 19-25 years was 5%, 3% in 26-30 years group [Table 2]. The prevalence in age groups of 31-35 years and of 36-55 years is also of interest, but it is worth to be noted that the number of persons in this age group is very low. The results of the logistic regression estimating total unadjusted prevalence association between contextual stress domains with hypertension are presented in [Table 3]. Keeping 19-25 years as the reference group, the odds of getting hypertension for 31-35 years old professionals was 48% lower and for 36-55 years was 60% lower [Table 4]. 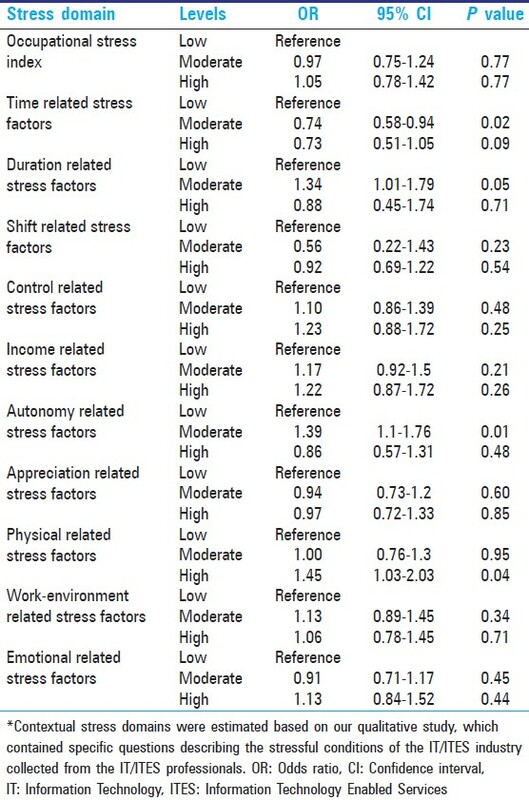 On adjusting for age, gender, waist by hip circumference, family history of high BP, socio-economic status, marital status, tobacco ever use, regular exercises for at least 20 min daily and alcohol use, the results for higher stress for contextual domains were statistically significant for autonomy and work-environment, whereas results for other contextual stress domains were not statistically significant. 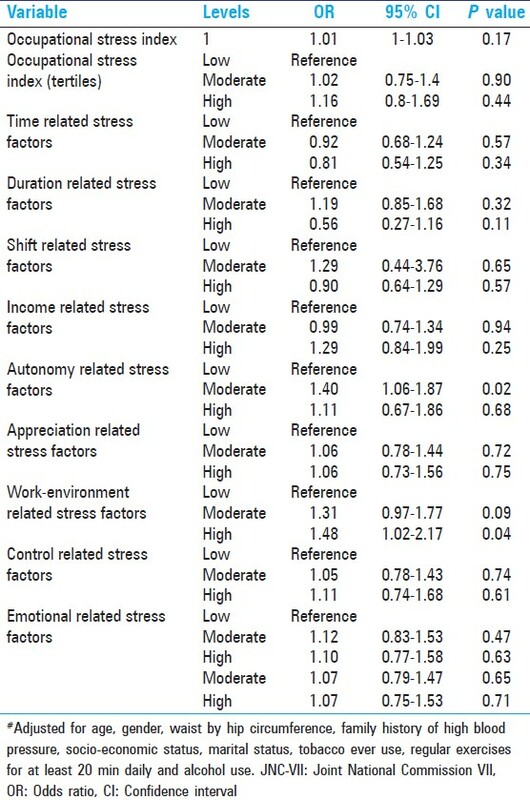 People with moderate autonomy had 40% higher and with high work-environment stressors had 48% chances of having hypertension compared with lower level of stress [Table 3], [Table 4], [Table 5]. We report the results of a moderately large study (N = 1071) of the prevalence of hypertension among IT professionals in the Indian subcontinent employed at 27 different IT companies in and around Bangalore. The focus of our study is on the age gradient of hypertension prevalence as well as exploring the association of psychosocial predictors of risk related to workplace stress. This establishes higher prevalence of hypertension in the younger age cohort. Our earlier work has established that several work stressors are not associated with hypertension. In this study, we report that the dimensions of workplace autonomy and workplace environment are associated. We report that moderate level of autonomy has a higher degree of association with prevalence of hypertension. CVD are a major cause of mortality and disease in the Indian subcontinent, causing more than 25% of deaths. It has been predicted that these diseases will increase rapidly in India and this country will be the locale of more than half the cases of heart disease in the world within the next 15 years. High BP is the predominant risk factor for CVD and evidence indicates that there is a high prevalence in both urban and rural areas. Indian urban population-based studies using World Health Organization guidelines for diagnosis have shown increasing hypertension among adults aged 20 years from about 5% in the 1960-70s to 11-15% in the late 1990s. , There were several studies done in India suggesting increasing trends in the prevalence of hypertension in urban subjects over the last four decades compared to the people in rural areas. ,,,,,, Our results are in conformity with earlier results in the general population but suggest that IT/ITES professionals are at higher-risk to get hypertension and are affected a decade earlier compared to earlier available evidence. The results from this study indicates, that there is a higher prevalence of hypertension among professionals in the early years of joining IT/ITES sectors compared to professionals who worked for more than 12 years. It was seen that the longer the professionals work, lower is the odds of getting hypertension. It is counterintuitive to have lower prevalence of hypertension with an increase in experience in IT/ITES professionals. The reason for this can be that the interplay of cardiovascular risk factors and job stress might result in the IT/ITES professionals getting hypertension in earlier years, as soon as they join the workforce. However, in due course of time, it might be possible that the professionals with hypertension leave the workforce. We cannot also rule out the likelihood of survivor bias as the professionals with hypertension might have developed coronary heart disease or changed jobs or might have succumbed to death. It might also be possible that workers who prefer to stay back in the organizations might gradually adapt to better coping mechanisms. Specifically, subjects with autonomy related stress and higher work-environment related stresses were found to have a higher prevalence of having Hypertension compared to the participants with their corresponding lower levels of stress. The autonomy domain of stress was estimated by calculating the weighted average of responses to questions on "Who is in charge of deciding your work schedule?" "Who evaluates your work?" and "Is your work constantly monitored?" In our study, the autonomy stressor domain comprised information on work schedule, evaluation of work and monitoring of the work. Earlier studies support these findings. , In our recent meta-analysis, we detected that job strain and hypertension were positively associated in studies judged to have better methodological quality, which depended heavily on the methods of exposure and outcome ascertainment. Our study is in conformity with the available evidence. The paucity of research exploring the association between job stressors and hypertension in India necessitates the replication of these results in other occupational groups including IT/ITES professionals. In particular, further exploration is necessary to understand how stress factors are related to overarching social determinants and how this might be related to their health status. We found a high prevalence of hypertension in the study population. The hypertensive professionals need to be followed-up to prevent CVD. There is a great opportunity for the primary prevention of (CVD) through the creation of awareness among IT/ITES professionals. The message to these professionals should focus on making lifestyle changes and continuously monitor BP. It is important to educate the professionals to engage in habits, which reduce the risk of hypertension such as regular exercises and necessary dietary modifications to prevent the onset of serious, life-threatening complications. Further, effective preventive programs will have to be designed to prevent hypertension in high-risk groups in India. The policymakers should be urged to provide resources to pilot intervention programs addressing primary prevention of hypertension. The positive impacts on health of working professionals can be achieved through working and collaborating with workers and employers. It would be in the best interest of the companies to focus on the long-term sustainable approaches and to urge engage employees to adjust healthy lifestyles to achieve a reduction of non-communicable diseases. The employers of IT/ITES should realize that small investments made in preventive activities will translate to saving expenses for the company and better health, thereby sustained productivity of their employees. The association of autonomy and work-environment with hypertension suggests that our results are in conformity with research on social determinants of health. Future research should focus on delineating the exposure and health status contrasts between two or more occupational groups. Attention should be paid toward prospective examination of the variance in induction periods and pathways connecting health outcomes and behaviors. Concurrently, worksite interventions can be piloted that aim at reducing psychosocial aspects of work-environment and autonomy domains including professional help on stress-management. There is evidence that renin-angiotensin - aldosterone system and catecholamine adaptations in persons with hypertension. In general, circulating levels of cortisol, epinephrine and norepinephrine and urinary norepinephrine excretion tend to be higher in patients with essential hypertension than in normotensive subjects. It is also evident that stress leads to higher levels of epinephrine. Hence, it is worth investigating whether the susceptibility of Indians for hypertension at a younger age is because of the way the endocrine system is regulated in them. The current study spurs the idea to explore the underlying endocrine mechanism in young Indians having hypertension. The study was supported through NIH/Fogarty International center, Fogarty/UCLA AIDS International Research and Training Program (Grant Number: D43 TW000013) and the Public Health Foundation of India provided partial grant. The authors would like to thank Shanthkumar for the help with field components of research, Wendy Aft for work on ethical approval and TS Ramesh for administrative support. 1. Kearney PM, Whelton M, Reynolds K, Muntner P, Whelton PK, He J. Global burden of hypertension: Analysis of worldwide data. Lancet 2005;365:217-23. 2. World Health Organization. Global Health Risks: mortality and Burden of Disease Attributable to Selected Major Risks. 2009. Geneva: World Health Organization; 2010. 3. Srinath RK. Protecting the heart of global development. Heart Beat, The World Heart Federation Newsletter. June 2005. Downloaded from web http://www.worldheartfederation.org/fileadmin/user_upload/documents/press-releases/HB/publications-heartbeat-2005-june.pdf Last accessed on 2014 Jan 10. 4. Babu G, Detels R. Prioritizing social actions and involving community for prevention of the non-communicable diseases. Internet J Epidemiol 2011;9. http://ispub.com/IJE/9/2/11556. Last accessed on 2014 Jan 10. 5. Yusuf S, Reddy S, Ounpuu S, Anand S. Global burden of cardiovascular diseases: Part II: Variations in cardiovascular disease by specific ethnic groups and geographic regions and prevention strategies. Circulation 2001;104:2855-64. 6. Landsbergis PA, Schnall PL, Warren K, Pickering TG, Schwartz JE. Association between ambulatory blood pressure and alternative formulations of job strain. Scand J Work Environ Health 1994;20:349-63. 7. Raymond S. Foreign assistance in an aging world. Foreign Affairs. The Council on Foreign Relations, Inc, Tampa, FL 33662-0001: 2003. p. 91-105. 8. Reddy KS. India wakes up to the threat of cardiovascular diseases. J Am Coll Cardiol 2007;50:1370-2. 9. Bloom DE, Canning D, Sevilla J. The Demographic Dividend: A New Perspective on the Economic Consequences of Population Change. Santa Monica, CA 90407-2138: Rand Corp.; 2003. 10. Jiang L, Beals J, Whitesell NR, Roubideaux Y, Manson SM, AI-SUPERPFP Team. Health-related quality of life and help seeking among American Indians with diabetes and hypertension. Qual Life Res 2009;18:709-18. 11. Kesavachandran C, Rastogi SK, Das M, Khan AM. Working conditions and health among employees at information technology - Enabled services: A review of current evidence. Indian J Med Sci 2006;60:300-7. 12. Babu GR. 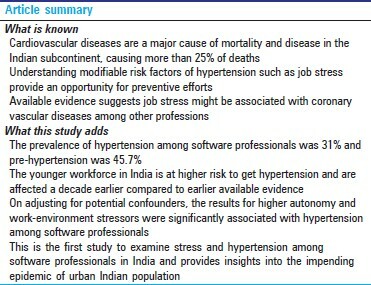 Prevalence of job stress, general health profile and hypertension among professionals in the information technology sector in Bengaluru, India [Doctoral Thesis]. Los Angeles: UC Los Angeles; 2012. 13. Babu GR, Mahapatra T, Detels R. Application of mixed methods for exploration of the association of job stress and hypertension among software professionals in Bengaluru, India. Indian J Occup Environ Med 2013;17:41-7. 14. Palike BB. Zonal map of Bangalore 2012. Available from: http://www.bbmp.gov.in/images/maps/BBMP Zones.jpg. Last accessed on 2012 Apr 23. 15. Palike BB. About BBMP, 2012. Available from: http://www.bbmp.gov.in/. Last accessed on 2012 Apr 23. 16. Altman DG. Statistics in medical journals: Developments in the 1980s. Stat Med 1991;10:1897-913. 17. McCullagh P. Regression models for ordinal data. J R Stat Soc Series B Stat Methodol 1980;42:109-42. 18. Teddlie C, Yu F. Mixed methods sampling. J Mix Methods Res 2007;1:77-100. 19. National Association of Software and Service Companies N. The IT-BPO Sector in India: Strategic Review 2012. 2012. 20. Daniel WW. Biostatistics: Basic Concepts and Methodology for the Health Sciences. John Wiley and Sons; 2010. 21. Dean A, Sullivan K, Soe M. OpenEpi: Open source epidemiologic statistics for public health, version 2.3. Update 2009;20: http://www.openepi.com/oe2.3/menu/openepimenu.htm. 22. Belkic K, Savic C. The occupational stress index: An approach derived from cognitive ergonomics applicable to clinical practice. Scand J Work Environ Health 2008;34:169. 23. Schnall P, Belkic K, Landsbergis P, Baker D. Point estimates of blood pressure at the worksite. Occup Med 2000;15:203-8. 24. Pickering TG, Hall JE, Appel LJ, Falkner BE, Graves J, Hill MN, et al. Recommendations for blood pressure measurement in humans and experimental animals: Part 1: Blood pressure measurement in humans: A statement for professionals from the Subcommittee of Professional and Public Education of the American Heart Association Council on High Blood Pressure Research. Circulation 2005;111:697-716. 25. Chobanian AV, Bakris GL, Black HR, Cushman WC, Green LA, Izzo JL Jr, et al. Seventh report of the Joint National Committee on Prevention, Detection, Evaluation, and Treatment of High Blood Pressure. Hypertension 2003;42:1206-52. 26. Ezzati M, Hoorn SV, Rodgers A, Lopez AD, Mathers CD, Murray CJ, et al. Estimates of global and regional potential health gains from reducing multiple major risk factors. Lancet 2003;362:271-80. 27. Gunnell D. Can adult anthropometry be used as a 'biomarker' for prenatal and childhood exposures? Int J Epidemiol 2002;31:390-4. 28. Institute S. SAS software: Version 9.1. NC: SAS Institute Cary; 2002. 29. Yusuf S, Reddy S, Ounpuu S, Anand S. Global burden of cardiovascular diseases: Part I: General considerations, the epidemiologic transition, risk factors, and impact of urbanization. Circulation 2001;104:2746-53. 30. Murray CJ, Lopez AD. Global mortality, disability, and the contribution of risk factors: Global Burden of Disease Study. Lancet 1997;349:1436-42. 31. Lawes CM, Vander Hoorn S, Rodgers A, International Society of Hypertension. Global burden of blood-pressure-related disease, 2001. Lancet 2008;371:1513-8. 32. Kristensen TS. Cardiovascular diseases and the work environment. A critical review of the epidemiologic literature on nonchemical factors. Scand J Work Environ Health 1989;15:165-79. 33. Gupta R. Burden of coronary heart disease in India. Indian Heart J 2005:57;632-8. 34. Singh J. Price of Success. The Tribue, Spectrum; 2007. [2007 Oct 14]. 35. Belkic K. The forebrain: Central stress mechanisms and cardiovascular responses. Hanley and Belfus; 1 edition (2000), United States, Pennsylvania; 2000. 36. Belkiæ K, Schnall P, Landsbergis P, Baker D. The workplace and cardiovascular health: Conclusions and thoughts for a future agenda. Occup Med 2000;15:307-21, v-vi. 37. Belkicì K, Savicì Č, Theorell T, Cizinsky S: Work stressors and cardiovascular risk: assessment for clinical practice. Stock- holm: Section for Stress Research (Karolinska Institute), World Health Organization Psychosocial Center; 1995. p. 256. 38. Karasek R, Gardell B, Lindell J. Work and non-work correlates of illness and behaviour in male and female Swedish white collar workers. J Organ Behav 1987;8:187-207. 39. Occupational mental health promotion: A prevention agenda based on education and treatment. The American Psychological Association/National Institute for Occupational Safety and Health, Health Promotion Panel, 1990 Work and Well-Being Conference. Am J Health Promot 1992;7:37-44. 40. Babu GR, Jotheeswaran A, Mahapatra T, Mahapatra S, Kumar A Sr, Detels R, et al. Is hypertension associated with job strain? A meta-analysis of observational studies. Occup Environ Med 2014;71:220-7.